A stray cat named Lurlene performed two charitable acts this year, when she adopted a neglected day-old puppy at an Ohio animal rescue, and earned the shelter a big paycheck for it, too. The pit bull puppy, later named Noland, was brought to Cleveland Animal Protective League in June after he was found alone in a garage, covered in fleas. 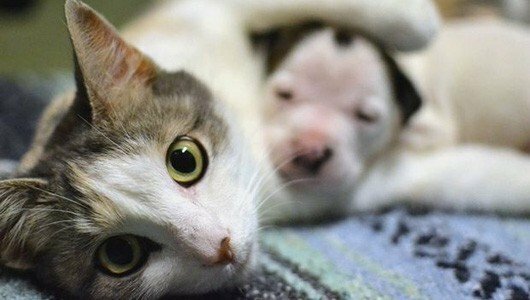 Lurlene, who had given birth to kittens just days before, immediately took to the pup. Noland began to thrive with his new family, and even used the litterbox with his adoptive siblings. "Remarkably, Lurlene welcomed Noland into her family, nurturing and nursing him as if he was one of her own," CAPL director Sharon Harvey told Cleveland.com. "And the kittens were fine with him, too."